In X-Ray Audio Live Stephen Coates tells the incredible story of soviet bootleggers who cut forbidden music into used X-ray plates during the Cold War. Sound artist Aleks Kolkowski cuts a fresh X-ray bootleg live. The pianist Louis Rastig, organizer of Berlin’s avant-garde Jazz festival A l’Arme!, drummer Marcel Drescher and the saxophonist Mette Rasmussen move between Progressive Rock, Punkjazz, electro-acoustic improvisation, and Drone. Lyrical and raucous, the trio install an update for Free Jazz. 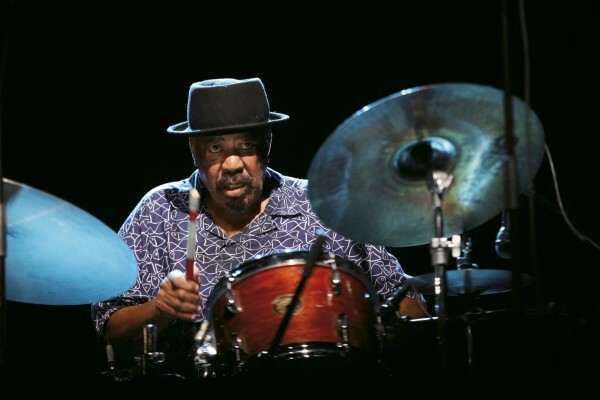 The exceptional drummer Louis Moholo-Moholo began his career with the legendary Blue Notes with whom he fled the Apartheid regime in 1964. At HKW he is accompanied by a star-studded squad: Jason Yarde on sax, Alexander Hawkins on piano and John Edwards on Bass.